Being from California, my first impression of Great Smoky Mountains National Park is a vast forest as far as the eye can see. I drove into the park from the east, via the Blue Ridge Parkway to Cherokee, NC, although I did not drop down from the blue ridge to visit Cherokee. One of the impressions that will probably always stay with me is the deep groove I felt when I gazed out over an area of old growth forest from a ridge top road within Great Smoky Mountains National Park. I felt like I could have been standing in a remote Amazon rain forest or maybe Borneo. Impressions like these are what motivated the creation of the Blue Ridge Parkway and Great Smoky Mountains National Park in the 1930s. Newfound Gap Road opened in 1932, prior to the establishment of Great Smoky Mountains National Park. The history of Great Smoky Mountains National Park is a different story than most national parks since families had settled in some of these backwoods valleys more than a century before President Coolidge signed a bill in May 1926 to establish Great Smoky Mountains National Park in North Carolina and Tennessee and Shenandoah National Park in Virginia. Acquiring the lands for the park meant negotiating with hundreds of small landowners and several timber and paper companies who owned vast stretches of forest land and about 85% of the land area to become Great Smoky Mountains National Park. John D. Rockefeller of Standard Oil is considered among the wealthiest men to have ever lived. He was 97 years old when he died in 1937. His wife Laura Spelman died in 1915. John Sr. and Laura had five children, but only one son, John D Rockefeller, Jr. It was John Jr. who became heavily involved in conservation and philanthropy. John Sr. established the Laura Spelman Rockefeller Memorial Fund in 1918, which was instrumental in the purchase of lands for Great Smoky Mountains National Park. John Jr. is estimated to have donated up to $45 million to help create and expand several U.S. parks including Acadia, Shenandoah, Yosemite and Grand Teton National Parks. Great Smoky Mountains National Park is the most visited of the national parks in the U.S. with more than 10 million visitors in 2014. The fact that it is free to enter, scenic highways designed for views traverse the park, and the park is a major transportation route between Knoxville, Tennessee and Asheville, North Carolina help make Great Smoky a park with high visitor numbers. Black bears are the most prominent symbol of Great Smoky Mountains National Park. There are approximately 1,500 black bears within national park boundaries. That is an average of two bears per square mile. Earlier in the day, before arriving in the national park, I was startled when hiking alone, outside in the woods of North Carolina. This black bear was only a taxidermy educational exhibit, but I did not know that when I glanced through the trees and first spotted the bear on the rock. This bear is located on a trail at the Pisgah Wildlife Education Center off US Route 276. Black bears were the major story for two days I was in Great Smoky Mountains National Park. A 16-year old boy from Ohio, camping in a wilderness section of the park with his father, was dragged by his head out of a hammock by a black bear. His father beat off the bear. The teenager survived and has a story to tell of how his head was in the mouth of a black bear. USA Today – Several Smokies trails closed after bear attacked teen – June 9. Radio and TV were filled with black bear attack advice. My number one takeaway from all the experts was FIGHT OFF A BLACK BEAR ATTACK. Experts on TV and radio repeatedly said, “if attacked by a black bear, fight back”. I stayed in a Gatlinburg, Tennessee hotel. No bears died due to my trip into Great Smoky Mountains National Park. Establishing Great Smoky Mountains National Park was a conservationist movement to save some of the remaining old growth forests of the southeastern states. This rugged and remote mountain section of the Appalachian Mountains kept old trees from being logged until industrial technology of rail and steam engines allowed profitable commercial logging. Clear cutting forest timber was profitable in the late 19th century. The vast forests North Carolina, Tennessee, South Carolina and Georgia were extensively logged in the fifty years prior to the establishment of the national park. A strong conservationist movement developed among the locals who were living with the eyesore and environmental impact of barren slopes within the watershed for these remote valleys. Saving old growth forest as an environmental movement within the United States had developed in California decades before, as it became apparent all the old growth coast redwood and giant sequoia trees would be felled without park protection. Nearly 80% of the old growth forest had been cut by the time Great Smoky Mountains National Park was established in 1934. Still, that means there are more than 100,000 acres of old growth forest within the 522,419 acres of the national park. The high elevation in much of the Great Smoky Mountains at 4,000 to 6,000 feet, with the highest point 6,643 feet at Clingman’s Dome, creates an environment conducive for hardwood trees like sugar maple, American beech and yellow birch trees, typical of Appalachian regions more than 1,000 miles north. Higher elevations on the ridge tops are conducive to spruce-fir forests. I get a lot of information about places I visit through signs. There are signs I photographed at most of the pull outs on the Newfound Gap Road. President Franklin D. Roosevelt formally dedicated Great Smoky Mountains National Park on September 2, 1940 at the Rockefeller Memorial Monument on Newfound Gap. During the six intervening years between the establishment of Great Smoky Mountains National Park and the President’s dedication, the Depression-era legislation creating the Civilian Conservation Corps had brought thousands of workers to the park to build the infrastructure of ranger centers, visitor centers, roads, trails, bridges and campgrounds. At its peak, there were 4,300 CCC workers in Great Smoky during the 1930s. 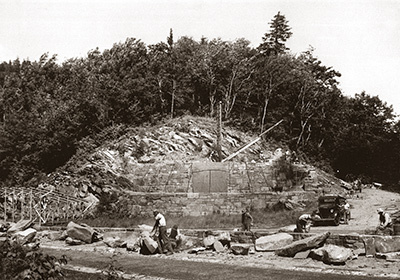 National Park Service – CCC workers building Rockefeller Memorial Monument at Newfound Gap. View from Newfound Gap in 2015. Two of my childhood dreams were to hike the Pacific Crest Trail and the Appalachian Trail. I blame National Geographic and PBS for those visions. I have now hiked both trails. I have hiked about 200 yards of the Appalachian Trail and about the same distance of the Pacific Crest Trail on sections where the road I was driving intersected with these trails. One of these days I still hope to have a wilder trail experience along these two famous hiking routes. Newfound Gap is on the border of North Carolina and Tennessee with a large parking lot and the Rockefeller Memorial Monument. I walked the stairs of the monument for views. Newfound Gap road sign: Gatlinburg, Tennessee 15 miles (right), Clingmans Dome 7 miles (left), Cherokee, North Carolina 20 miles (left). North Carolina Tennessee State Line Elevation 5,046 feet. This park was given one half by the people and the states of North Carolina and Tennessee and by the United States of America and one half in memory of Laura Spelman Rockefeller by the Laura Spelman Rockefeller Memorial founded by her husband John. D. Rockefeller. Have you enjoyed visiting Great Smoky Mountains National Park? The park was created through the dedication, hard work and pennies of thousands of ordinary people and the philanthropy and donation from the immense wealth of one individual – John D. Rockefeller. Black bear at Sugarlands Visitor Center, Great Smoky Mountains National Park.